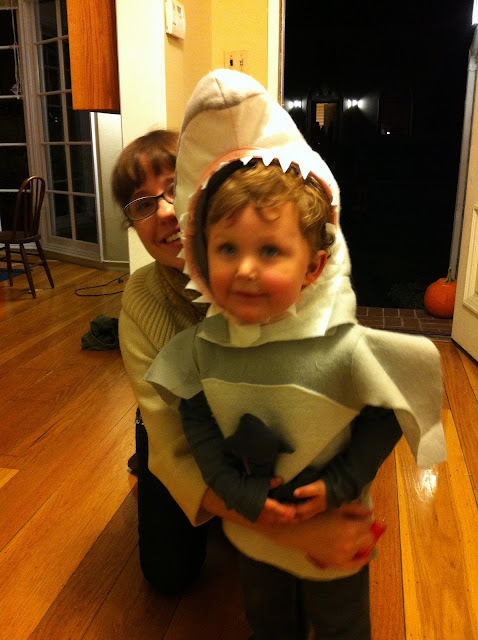 Inder Loves Folk Art: Slightly blurry proof that Joe willingly wore his shark costume. Slightly blurry proof that Joe willingly wore his shark costume. I know I'm biased and all, but wow, that is the best-looking little shark I have ever seen. Yaaayyy! Oh seriously, that costume is the best thing ever. I love how he looks out of that toothy mouth (versus eyeholes) in this costume. So cute! To me, in this picture, he seems more like a little boy and less like toddler than in any of the other pictures I've seen. Your little guy is growing up! The best jolly shark I have ever seen!